Picture the tall spire of the iconic St Mark’s Church and the buildings surrounding St Mark’s Square in Venice, and then try to imagine this historic skyline transplanted to Las Vegas. 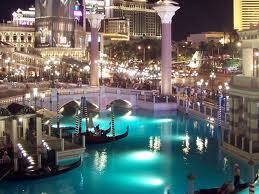 You will now have some idea of the splendor of the Venetian Resort. This amazing building houses a hotel containing many luxurious suites, a 120,000 sq ft casino, meeting rooms, restaurants and a theater, all designed with an Italian theme. The casino is a gambler’s delight with slots that have given generous rewards of up to $30 million. The Venetian claims that its machines payout the highest wins in Vegas. From a mere 25 cents to $25, visitors can play video slots. Some Venetian visitors have their favorite high roller machines, and MegaJackpots, Megabucks and the Wheel of Fortune are all available at the casino. $8. There is a special area for those more confident players who wish to take part in a high stakes game with seven special tables. Novices who want to learn all about poker might like to visit the Poker Room and take part in the Venetian’s free poker school. The Poker Room also hosts private poker games for groups of friends. There are 139 casino games on offer at The Venetian, including craps, roulette, and baccarat, as well as many other popular and well-known games. For those who take their gambling seriously, there is a 20-table high roller room. Sports fans can indulge their passion in the specialist high tech Cantor Race and Sports Book, where visitors can follow their sports in an individual seating area complete with personal monitor, or they can watch the gigantic 100ftx30ft HD plasma screen that dominates the room. There are 100 individual seats in this area and extra VIP seats. One of the bonuses of this area is that gamblers don’t have to leave their seats to get a drink or snack; the area is fully serviced by waiting staff. Four times a year The Venetian is host to its very own Deep Stack Extravaganza, which is a no limit hold‘em poker tournament. For those who wish to taken part in this exciting tournament, buy ins start from $225 all the way up to $5,000. The Venetian resort has plenty to occupy its guests in between gambling. Those that wish can take in a gondola ride along the replica Grand Canal. Alternatively, visitors who enjoy good food might wish to explore the resort’s 20 restaurants, or they might like to hire one of the many luxury suites and enjoy some superlative room service. There are always first-rate international cabaret acts to go and see, and renowned entertainers including Joan Rivers and Tim Allen frequently play The Venetian.